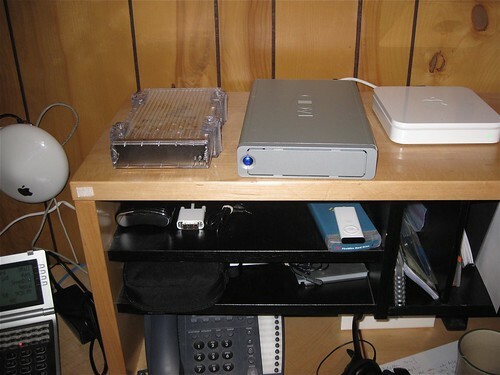 Last night I re-wired my home network with a new Apple Airport Extreme — an 802.11n speed network hub, it is then hard wired to my older Airport (left) which serves the premises 802.11b/g speeds for the iPhone and guests (if you all devices running 802.11b/g to use the new Airport, it slows the speed down, so the new one is for n speed devices only- my laptop). My old 400 Gb drive (left) got toasted and I am praying Disk Warrior can pull some magic out of it. The new Airport alone is a lot faster than my previous setup which had my cable modem running through the NetGear switch, which I think means all of the DHCP action was going back to my ISP. With the new Airpoer Extreme being downstream from the cable modem, the DHCP is now being done locally, and everything is being the built in firewall. 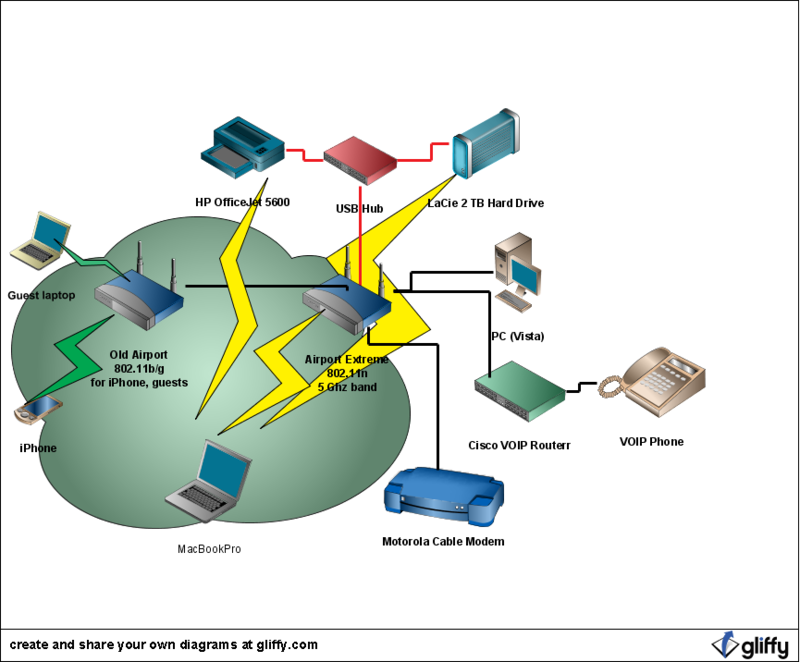 I got some ideas for the dual airport setup from an article on AppleInsider that gave me the idea of having a “fast lane” network and a slower one for the older devices and iPhone, plus how to configure the new Airport Extreme for making best use of the 5 GHz band. But it took about 12 hours for Time Machine to do its first backup of 102 Gb — part of this was user error as for the first three hours I was connected to the network on my older airport, and then I was probably making things slower by being online all day. The other unexpected result was that on the wireless connected hard drive, the Time Machine files are stored in a disk image format– I am hoping that is not a problem as the thing grows. Might have to research this one. But now Time Machine is doing its hourly incremental backups, so I am much better covered then before when I only updated when I remembered to plug in the external drive (which got full anyhow). And printing across wireless is just fantastic. The only downside is that the HP Scanner software cannot locate the HP device via wireless. 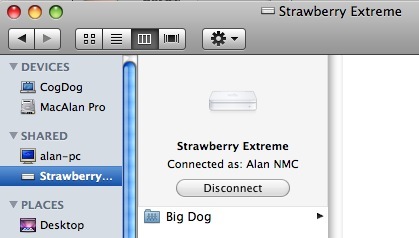 The new LaCie 2 TB “Big Dog” drive is visible as a shared device, as is, in theory, my PC. And.. now my PC is visible as a shared drive, and as soon as I figure out the bizarre vista file sharing, moving files should be easy. It’s a whole new network! UPDATE: (Jan 7, 2008) After all this I have taken the Big Dog drive off of the wireless network. It was worth the experiment. If all I was doing was Time Machine back up, it would work fine– it is the first write that is time consuming because it is copying everything, but beyond that, the backups are smaller and barely noticeable. However my problem is I am using the same drive as an archive of old project and media files (things taken off my main work machine) and even basic copy time was too slow over the wireless. So I have taken the 2 Gb drive off the Extreme and have it connected, when I am working near it, by Firewire 800, and copying from other drives is lightning fast. With my 400 Gb drive on the fritz, I just purchased a 750Gb LaCie from Amazon; the prices are just amazing if you go back in time at all. This drive is mainly for my personal media, and the long delayed project of putting on disc all the photos that are sitting in a plastic box in my closet on about 200 CDs and DVDs. Thanks for sharing the facts and details. I’ll be interested to read about disk image issue, if you do research it. @Skip – Found some stuff, but nothing to suggest that the disk image is a problem. If it gets corrupt, apparently you can run disk utility tools on the image file. I’ll echo Skip and give you full props for sharing the setup with us. I like the way you are using the older Airport as an access point for machines other than your laptop. Do you have any security set up on the “guest” access point or is it left completely open? What about security on the new Airport – WPA, MAC address whitelist? I’ll probably use a couple of the techniques you’ve shown, and I’ll definitely be showing your setup to my Grade 10 computer networking class (with proper attribution, of course). @Rob Wall: I have WPA2 Personal running on the new Airport Extreme; but you give me an idea that doing a MAC address whitelist would be maybe better; I intend to be the only user. My guest access one is (yes I know it is bad) wide open– the reason being that I am in a very small town where I have no neighbors even here in reception range; sure someone might drive by and pick up a signal, but this is a smal town in a rural county, and the amount of use of technology is really low. I previously had it on WPA2 but had a group of techie friends visit a few months ago, and felt it was easier not to mess around with passwords. So woot free wireless in Strawberry! The AppleInsider article was really key on getting the ne Extreme set up right- set to do 802.11n on the 5 GHz band and to use the dual channels setting to maximize the “tube” (the way I understand it). My access is noticeable faster; my Skype video quality is very clear now, where before it got blocky and dropped frames; and my VOIP phone is now usable; previously it was very choppy and I would lose about every 4the word.